The ligands, denoted by letter L, signal for platelets (P) to migrate towards the wound (Site A). As more platelets gather around the opening, they produce more ligands to amplify the response. The platelets congregate around the wound in order to create a cap to stop blood flow out of the tissue. On a stained blood smear, platelets appear as dark purple spots, about 20% the diameter of red blood cells. The smear is used to examine platelets for size, shape, qualitative number, and clumping. The ratio of platelets to red blood cells in a healthy adult ranges from 1:10 to 1:20. One major function of platelets is to contribute to hemostasis: the process of stopping bleeding at the site of interrupted endothelium. They gather at the site and unless the interruption is physically too large, they plug the hole. First, platelets attach to substances outside the interrupted endothelium: adhesion. Second, they change shape, turn on receptors and secrete chemical messengers: activation. Third, they connect to each other through receptor bridges: aggregation. Formation of this platelet plug (primary hemostasis) is associated with activation of the coagulation cascade with resultant fibrin deposition and linking (secondary hemostasis). These processes may overlap: the spectrum is from a predominantly platelet plug, or "white clot" to a predominantly fibrin, or "red clot" or the more typical mixture. Some would add the subsequent retraction and platelet inhibition as fourth and fifth steps to the completion of the process and still others a sixth step wound repair. Platelets also participate in both innate and adaptive intravascular immune responses. Low platelet concentration is called thrombocytopenia, and is due to either decreased production or increased destruction. Elevated platelet concentration is called thrombocytosis, and is either congenital, reactive (to cytokines), or due to unregulated production: one of the myeloproliferative neoplasms or certain other myeloid neoplasms. A disorder of platelet function is a thrombocytopathy. Normal platelets can respond to an abnormality on the vessel wall rather than to hemorrhage, resulting in inappropriate platelet adhesion/activation and thrombosis: the formation of a clot within an intact vessel. This type of thrombosis arises by mechanisms different from those of a normal clot: namely, extending the fibrin of venous thrombosis; extending an unstable or ruptured arterial plaque, causing arterial thrombosis; and microcirculatory thrombosis. An arterial thrombus may partially obstruct blood flow, causing downstream ischemia, or may completely obstruct it, causing downstream tissue death. Platelet concentration is measured either manually using a hemocytometer, or by placing blood in an automated platelet analyzer using electrical impedance, such as a Coulter counter. The normal range (99% of population analyzed) for platelets in healthy Caucasians is 150,000 to 450,000 per cubic millimeter (a mm3 equals a microliter). or 150–450 × 109 per liter. The normal range has been confirmed to be the same in the elderly and Spanish populations. Peripheral zone – is rich in glycoproteins required for platelet adhesion, activation, and aggregation. For example, GPIb/IX/X; GPVI; GPIIb/IIIa. Sol-gel zone – is rich in microtubules and microfilaments, allowing the platelets to maintain their discoid shape. Organelle zone – is rich in platelet granules. Alpha granules contain clotting mediators such as factor V, factor VIII, fibrinogen, fibronectin, platelet-derived growth factor, and chemotactic agents. Delta granules, or dense bodies, contain ADP, calcium, serotonin, which are platelet-activating mediators. Membranous zone – contains membranes derived from megakaryocytic smooth endoplasmic reticulum organized into a dense tubular system which is responsible for thromboxane A2 synthesis. This dense tubular system is connected to the surface platelet membrane to aid thromboxane A2 release. 3D rendering of four inactivated and three activated platelets. An overview summarizing platelet dynamics, the complex process of converting inactive platelets into a platelet plug, is essentialEL 2. Complicating any verbal description is the fact that at least 193 proteins and 301 interactions are involved in platelet dynamics. The separation of platelet dynamics into three stages is useful in this regard, but it is artificial: in fact, each stage is initiated in rapid succession, and each continues until the trigger for that stage is no longer present, so there is overlap. When the endothelial layer is disrupted, collagen and VWF anchor platelets to the subendothelium. Platelet GP1b-IX-V receptor binds with VWF; and GPVI receptor and integrin α2β1 bind with collagen. The intact endothelial lining inhibits platelet activation by producing nitric oxide, endothelial-ADPase, and PGI2 (Prostacyclin). Endothelial-ADPase degrades the platelet activator ADP. Platelet activation begins seconds after adhesion occurs. It is triggered when collagen from the subendothelium binds with its receptors (GPVI receptor and integrin α2β1) on the platelet. GPVI is associated with the Fc receptor gamma chain and leads via the activation of a tyrosine kinase cascade finally to the activation of PLC-gamma2 PLCG2 and more calcium release. Tissue factor also binds to factor VII in the blood, which initiates the intrinsic coagulation cascade to increase thrombin production. Thrombin is a potent platelet activator, acting through Gq and G12. These are G protein coupled receptors and they turn on calcium mediated signaling pathways within the platelet, overcoming the baseline calcium efflux. Families of three G proteins (Gq, Gi, G12) operate together for full activation. Thrombin also promotes secondary fibrin-reinforcement of the platelet plug. Platelet activation in turn degranulates and releases factor V and fibrinogen, potentiating the coagulation cascade. So in reality the process of platelet plugging and coagulation are occurring simultaneously rather than sequentially, with each inducing the other to form the final fibrin-crosslinked thrombus. α granules (alpha granules) – containing P-selectin, platelet factor 4, transforming growth factor-β1, platelet-derived growth factor, fibronectin, B-thromboglobulin, vWF, fibrinogen, and coagulation factors V and XIII. δ granules (delta or dense granules) – containing ADP or ATP, calcium, and serotonin. λ granules (lambda granules) – contents involved in resorption during later stages of vessel repair. Mitochondrial hyperpolarization is a key event in initiating changes in morphology. Intraplatelet calcium concentration increases, stimulating the interplay between the microtubule/actin filament complex. The continuous changes in shape from the unactivated to the fully activated platelet is best seen on scanning electron microscopy. Three steps along this path are named early dendritic, early spread and spread. The surface of the unactivated platelet looks very similar to the surface of the brain, with a wrinkled appearance from numerous shallow folds to increase the surface area; early dendritic, an octopus with multiple arms and legs; early spread, an uncooked frying egg in a pan, the "yolk" being the central body; and the spread, a cooked fried egg with a denser central body. These changes are all brought about by the interaction of the microtubule/actin complex with the platelet cell membrane and open canalicular system (OCS), which is an extension and invagination of that membrane. This complex runs just beneath these membranes, and is the chemical motor which literally pulls the invaginated OCS out of the interior of the platelet, like turning pants pockets inside out, creating the dendrites. This process is similar to the mechanism of contraction in a muscle cell.. The entire OCS thus becomes indistinguishable from the initial platelet membrane as it forms the "fried egg". This dramatic increase in surface area comes about with neither stretching nor adding phospholipids to the platelet membrane. In addition to interacting with vWF and fibrin, platelets interact with thrombin, Factors X, Va, VIIa, XI, IX, and prothrombin to complete formation via the coagulation cascade. Six studies suggested platelets express tissue factor: the definitive study shows they do not. The platelets from rats were conclusively shown to express tissue factor protein and also it was proved that the rat platelets carry both the tissue factor pre-mRNA and mature mRNA. Aggregation begins minutes after activation, and occurs as a result of turning on the GPIIb/IIIa receptor, allowing these receptors to bind with vWF or fibrinogen. There are around 60 000 of these receptors per platelet. When any one or more of at least nine different platelet surface receptors are turned on during activation, intraplatelet signaling pathways cause existing GpIIb/IIIa receptors to change shape – curled to straight – and thus become capable of binding. Since fibrinogen is a rod-like protein with nodules on either end capable of binding GPIIb/IIIa, activated platelets with exposed GPIIb/IIIa can bind fibrinogen to aggregate. GPIIb/IIIa may also further anchor the platelets to subendothelial vWF for additional structural stabilisation. Platelets have central role in innate immunity, initiating and participating in multiple inflammatory processes, directly binding pathogens and even destroying them. This support clinical data which show that many with serious bacterial or viral infections have thrombocytopenia, thus reducing their contribution to inflammation. Also platelet-leukocyte aggregates (PLAs) found in circulation are typical in sepsis or inflammatory bowel disease, showing the connection between thrombocytes and immune cells sensu stricto. As hemostasis is a basic function of thrombocytes in mammals, it also has its uses in possible infection confinement. In case of injury, platelets, together with the coagulation cascade, form the first line of defense by forming a blood clot. Thus, hemostasis and host defense were intertwined in evolution. For example, in the Atlantic horseshoe crab (living fossil estimated to be over 400 million years old), the only blood cell type, the amebocyte, facilitates both the hemostatic function and the encapsulation and phagocytosis of pathogens by means of exocytosis of intracellular granules containing bactericidal defense molecules. Blood clotting supports the immune function by trapping the pathogenic bacteria within. Although thrombosis, blood coagulation in intact blood vessels, is usually viewed as a pathological immune response, leading to obturation of lumen of blood vessel and subsequent hypoxic tissue damage, in some cases, directed thrombosis, called immunothrombosis, can locally control the spread of the infection. The thrombosis is directed in concordance of platelets, neutrophils and monocytes. The process is initiated either by immune cells sensu stricto by activating their pattern recognition receptors (PRRs), or by platelet-bacterial binding. Platelets can bind to bacteria either directly through thrombocytic PRRs and bacterial surface proteins, or via plasma proteins that bind both to platelets and bacteria. Monocytes respond to bacterial pathogen-associated molecular patterns (PAMPs), or damage-associated molecular patterns (DAMPs) by activating the extrinsic pathway of coagulation. Neutrophils facilitate the blood coagulation by NETosis. In turn, the platelets facilitate neutrophils' NETosis. NETs bind tissue factor, binding the coagulation centres to the location of infection. They also activate the intrinsic coagulation pathway by providing its negatively charged surface to the factor XII. Other neutrophil secretions, such as proteolytic enzymes, which cleave coagulation inhibitors, also bolster the process. In case of inbalance throughout the regulation of immunothrombosis, this process can quickly become aberrant. Regulatory defects in immunothrombosis are suspected to be major factor in causing pathological thrombosis in many forms, such as disseminated intravascular coagulation (DIC) or deep vein thrombosis. DIC in sepsis is a prime example of both dysregulated coagulation process as well as undue systemic inflammatory response resulting in multitude of microthrombi of similar composition to that in physiological immunothrombosis - fibrin, platelets, neutrophils and NETs. Platelets are rapidly deployed to sites of injury or infection, and potentially modulate inflammatory processes by interacting with leukocytes and by secreting cytokines, chemokines and other inflammatory mediators. Platelets also secrete platelet-derived growth factor (PDGF). Platelets modulate neutrophils by forming platelet-leukocyte aggregates (PLAs). These formation induce upregulated production of αmβ2 (Mac-1) integrin in neutrophils. Interaction with PLAs also induce degranulation and increased phagocytosis in neutrophils. Platelets are also the largest source of soluble CD40L which induces production of reactive oxygen species (ROS) and upregulate expression of adhesion molecules, such as E-selectin, ICAM-1 and VCAM-1, in neutrophils, activates macrophages and activates cytotoxic response in T and B lymphocytes. Recently, the dogma that mammalian platelets lacking nucleus are unable of autonomous locomotion was broken. In fact, the platelets are active scavengers, scaling walls of blood vessels and reorganising the thrombus. They are able to recognize and adhere to many surfaces, including bacteria. They are even able to fully envelop them in their open canalicular system (OCP), leading to proposed name of the process being "covercytosis", rather than phagocytosis, as OCS is merely an invagination of outer plasma membrane. These platelet-bacteria bundles are then used as an interation platform for neutrophilsm which destroy the bacteria using the NETosis and phagocytosis. Platelets also participate in chronic inflammatory diseases, such as synovitis or rheumatoid arthritis. Platelets are activated by collagen receptor glycoprotein IV (GPVI). Proinflammatory platelet microvesicles trigger constant cytokine secretion from neighboring fibroblast-like synoviocytes, most prominently Il-6 and Il-8. Inflammatory damage to surrounding extracellular matrix continually reveals more collagen, maintaining the microvesicle production. Activated platelets are able to participate in adaptive immunity, interacting with antibodies. They are able to specifically bind IgG through FcγRIIA, receptor for constant fragment (Fc) of IgG. When activated and bound to IgG opsonised bacteria, the platelets subsequently release reactive oxygen species (ROS), antimicrobial peptides, defensins, kinocidins and proteases, killing the bacteria directly. Platelets also secrete proinflammatory and procoagulant mediators such as inorganic polyphosphates or platelet factor 4 (PF4), connecting innate and adaptive immune responses. One can get a clue as to whether bleeding is due to a platelet disorder or a coagulation factor disorder by the characteristics and location of the bleeding. :815, Table 39-4 All of the following suggest platelet bleeding, not coagulation bleeding: the bleeding from a skin cut such as a razor nick is prompt and excessive, but can be controlled by pressure; spontaneous bleeding into the skin which causes a purplish stain named by its size: petechiae, purpura, ecchymoses; bleeding into mucous membranes causing bleeding gums, nose bleed, and gastrointestinal bleeding; menorrhagia; and intraretinal and intracranial bleeding. Developed by Duke in 1910 and bearing his name, it measured the time for bleeding to stop from a standardized wound in the ear lobe which is blotted each 30 seconds. Normal was less than 3 minutes. More modern techniques are now used. A normal bleeding time reflects sufficient platelet numbers and function plus normal microvascular. In the Multiplate analyzer, anticoagulated whole blood is mixed with saline and a platelet agonist in a single use cuvette with two pairs of electrodes. The increase in impedance between the electrodes as platelets aggregate onto them, is measured and visualized as a curve. The PFA-100 (Platelet Function Assay-100) is a system for analysing platelet function in which citrated whole blood is aspirated through a disposable cartridge containing an aperture within a membrane coated with either collagen and epinephrine or collagen and ADP. These agonists induce platelet adhesion, activation and aggregation leading to rapid occlusion of the aperture and cessation of blood flow termed the closure time (CT). An elevated CT with EPI and collagen can indicate intrinsic defects such as von Willebrand disease, uremia, or circulating platelet inhibitors. The follow up test involving collagen and ADP is used to indicate if the abnormal CT with collagen and EPI was caused by the effects of acetyl sulfosalicylic acid (aspirin) or medications containing inhibitors. Platelet transfusion is most frequently used to correct unusually low platelet counts, either to prevent spontaneous bleeding (typically at counts below 10×109/L) or in anticipation of medical procedures that will necessarily involve some bleeding. For example, in patients undergoing surgery, a level below 50×109/L is associated with abnormal surgical bleeding, and regional anaesthetic procedures such as epidurals are avoided for levels below 80×109/L. Platelets may also be transfused when the platelet count is normal but the platelets are dysfunctional, such as when an individual is taking aspirin or clopidogrel. Finally, platelets may be transfused as part of a massive transfusion protocol, in which the three major blood components (red blood cells, plasma, and platelets) are transfused to address severe hemorrhage. Platelet transfusion is contraindicated in thrombotic thrombocytopenic purpura (TTP), as it fuels the coagulopathy. 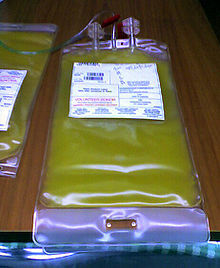 Platelets are stored under constant agitation at 20–24 °C (68–75.2 °F). Units can not be refrigerated as this causes platelets to change shape and lose function. Storage at room temperature provides an environment where any bacteria that are introduced to the blood component during the collection process may proliferate and subsequently cause bacteremia in the patient. Regulations are in place in the United States that require products to be tested for the presence of bacterial contamination before transfusion. Instead of having platelets, non-mammalian vertebrates have nucleated thrombocytes, which resemble B lymphocytes in morphology. They aggregate in response to thrombin, but not to ADP, serotonin, nor adrenaline, as platelets do. George Gulliver in 1841 drew pictures of platelets using the twin lens (compound) microscope invented in 1830 by Joseph Jackson Lister. This microscope improved resolution sufficiently to make it possible to see platelets for the first time. William Addison in 1842 drew pictures of a platelet-fibrin clot. Lionel Beale in 1864 was the first to publish a drawing showing platelets. Max Schultze in 1865 described what he called "spherules", which he noted were much smaller than red blood cells, occasionally clumped, and were sometimes found in collections of fibrin material. Giulio Bizzozero in 1882 studied the blood of amphibians microscopically in vivo. He named Schultz's spherules (It.) piastrine: little plates. William Osler observed platelets and, in published lectures in 1886, called them a third corpuscle and a blood plaque; and described them as "a colorless protoplasmic disc". James Wright examined blood smears using the stain named for him, and used the term plates in his 1906 publication but changed to platelets in his 1910 publication which has become the universally accepted term. ^ Laki K (December 1972). "Our ancient heritage in blood clotting and some of its consequences". Annals of the New York Academy of Sciences. 202 (1): 297–307. Bibcode:1972NYASA.202..297L. doi:10.1111/j.1749-6632.1972.tb16342.x. PMID 4508929. ^ Machlus KR, Thon JN, Italiano JE (April 2014). "Interpreting the developmental dance of the megakaryocyte: a review of the cellular and molecular processes mediating platelet formation". British Journal of Haematology. 165 (2): 227–36. doi:10.1111/bjh.12758. PMID 24499183. ^ Jain NC (June 1975). "A scanning electron microscopic study of platelets of certain animal species". Thrombosis et Diathesis Haemorrhagica. 33 (3): 501–7. PMID 1154309. ^ a b c d e f g Michelson, Alan D. (2013). Platelets (3rd ed.). Academic. ISBN 9780123878373. ^ Paulus JM (September 1975). "Platelet size in man". Blood. 46 (3): 321–36. PMID 1097000. ^ a b c d e Yip J, Shen Y, Berndt MC, Andrews RK (February 2005). "Primary platelet adhesion receptors". IUBMB Life. 57 (2): 103–8. doi:10.1080/15216540500078962. PMID 16036569. ^ Berridge, Michael J. (1 October 2014). "Module 11: Cell Stress, Inflammatory Responses and Cell Death". Cell Signalling Biology. 6: csb0001011. doi:10.1042/csb0001011. ^ a b c d Gaertner F, Massberg S (December 2016). "Blood coagulation in immunothrombosis-At the frontline of intravascular immunity". Seminars in Immunology. 28 (6): 561–569. doi:10.1016/j.smim.2016.10.010. PMID 27866916. ^ Hampton T (April 2018). "Platelets' Role in Adaptive Immunity May Contribute to Sepsis and Shock". JAMA. 319 (13): 1311–1312. doi:10.1001/jama.2017.12859. PMID 29614158. ^ Girling JH (July 1962). "An automatic platelet counting technique". The Journal of Medical Laboratory Technology. 19: 168–73. PMID 13898919. ^ Ross DW, Ayscue LH, Watson J, Bentley SA (September 1988). "Stability of hematologic parameters in healthy subjects. Intraindividual versus interindividual variation". American Journal of Clinical Pathology. 90 (3): 262–7. doi:10.1093/ajcp/90.3.262. PMID 3414599. ^ Ruocco L, Del Corso L, Romanelli AM, Deri D, Pentimone F (April 2001). "New hematological indices in the healthy elderly". Minerva Medica. 92 (2): 69–73. PMID 11323567. ^ Lozano M, Narváez J, Faúndez A, Mazzara R, Cid J, Jou JM, Marín JL, Ordinas A (June 1998). "[Platelet count and mean platelet volume in the Spanish population]". Medicina Clinica. 110 (20): 774–7. PMID 9666418. ^ Harker LA, Roskos LK, Marzec UM, Carter RA, Cherry JK, Sundell B, Cheung EN, Terry D, Sheridan W (April 2000). "Effects of megakaryocyte growth and development factor on platelet production, platelet life span, and platelet function in healthy human volunteers". Blood. 95 (8): 2514–22. PMID 10753829. ^ Mason KD, Carpinelli MR, Fletcher JI, Collinge JE, Hilton AA, Ellis S, Kelly PN, Ekert PG, Metcalf D, Roberts AW, Huang DC, Kile BT (March 2007). "Programmed anuclear cell death delimits platelet life span". Cell. 128 (6): 1173–86. doi:10.1016/j.cell.2007.01.037. PMID 17382885. ^ Palmer RM, Ferrige AG, Moncada S (1987). "Nitric oxide release accounts for the biological activity of endothelium-derived relaxing factor". Nature. 327 (6122): 524–6. Bibcode:1987Natur.327..524P. doi:10.1038/327524a0. PMID 3495737. ^ Jones CI, Barrett NE, Moraes LA, Gibbins JM, Jackson DE (2012). "Endogenous inhibitory mechanisms and the regulation of platelet function". Platelets and Megakaryocytes. Methods in Molecular Biology. 788. pp. 341–66. doi:10.1007/978-1-61779-307-3_23. ISBN 978-1-61779-306-6. PMID 22130718. ^ Marcus AJ, Broekman MJ, Drosopoulos JH, Olson KE, Islam N, Pinsky DJ, Levi R (April 2005). "Role of CD39 (NTPDase-1) in thromboregulation, cerebroprotection, and cardioprotection". Seminars in Thrombosis and Hemostasis. 31 (2): 234–46. doi:10.1055/s-2005-869528. PMID 15852226. ^ Dubois C, Panicot-Dubois L, Merrill-Skoloff G, Furie B, Furie BC (May 2006). "Glycoprotein VI-dependent and -independent pathways of thrombus formation in vivo". Blood. 107 (10): 3902–6. doi:10.1182/blood-2005-09-3687. PMC 1895285. PMID 16455953. ^ Matarrese P, Straface E, Palumbo G, Anselmi M, Gambardella L, Ascione B, Del Principe D, Malorni W (February 2009). "Mitochondria regulate platelet metamorphosis induced by opsonized zymosan A--activation and long-term commitment to cell death". The FEBS Journal. 276 (3): 845–56. doi:10.1111/j.1742-4658.2008.06829.x. PMID 19143843. ^ White JG (December 1987). "An overview of platelet structural physiology". Scanning Microsc. 1 (4): 1677–700. PMID 3324323. ^ a b Bouchard BA, Mann KG, Butenas S (August 2010). "No evidence for tissue factor on platelets". Blood. 116 (5): 854–5. doi:10.1182/blood-2010-05-285627. PMC 2918337. PMID 20688968. ^ Ahmad SS, Rawala-Sheikh R, Walsh PN (1992). "Components and assembly of the factor X activating complex". Seminars in Thrombosis and Hemostasis. 18 (3): 311–23. doi:10.1055/s-2007-1002570. PMID 1455249. ^ Tyagi T, Ahmad S, Gupta N, Sahu A, Ahmad Y, Nair V, Chatterjee T, Bajaj N, Sengupta S, Ganju L, Singh SB, Ashraf MZ (February 2014). "Altered expression of platelet proteins and calpain activity mediate hypoxia-induced prothrombotic phenotype". Blood. 123 (8): 1250–60. doi:10.1182/blood-2013-05-501924. PMID 24297866. ^ O'Halloran AM, Curtin R, O'Connor F, Dooley M, Fitzgerald A, O'Brien JK, Fitzgerald DJ, Shields DC (February 2006). "The impact of genetic variation in the region of the GPIIIa gene, on Pl expression bias and GPIIb/IIIa receptor density in platelets". British Journal of Haematology. 132 (4): 494–502. doi:10.1111/j.1365-2141.2005.05897.x. PMID 16412022. ^ Coller BS, Cheresh DA, Asch E, Seligsohn U (January 1991). "Platelet vitronectin receptor expression differentiates Iraqi-Jewish from Arab patients with Glanzmann thrombasthenia in Israel". Blood. 77 (1): 75–83. PMID 1702031. ^ Movat HZ, Weiser WJ, Glynn MF, Mustard JF (December 1965). "Platelet phagocytosis and aggregation". The Journal of Cell Biology. 27 (3): 531–43. doi:10.1083/jcb.27.3.531. PMC 2106759. PMID 4957257. ^ a b c Jenne CN, Urrutia R, Kubes P (June 2013). "Platelets: bridging hemostasis, inflammation, and immunity". International Journal of Laboratory Hematology. 35 (3): 254–61. doi:10.1111/ijlh.12084. PMID 23590652. ^ Cox D, Kerrigan SW, Watson SP (June 2011). "Platelets and the innate immune system: mechanisms of bacterial-induced platelet activation". Journal of Thrombosis and Haemostasis. 9 (6): 1097–107. doi:10.1111/j.1538-7836.2011.04264.x. PMID 21435167. ^ Weyrich AS, Zimmerman GA (September 2004). "Platelets: signaling cells in the immune continuum". Trends in Immunology. 25 (9): 489–95. doi:10.1016/j.it.2004.07.003. PMID 15324742. ^ Wagner DD, Burger PC (December 2003). "Platelets in inflammation and thrombosis". Arteriosclerosis, Thrombosis, and Vascular Biology. 23 (12): 2131–7. doi:10.1161/01.ATV.0000095974.95122.EC. PMID 14500287. ^ Diacovo TG, Puri KD, Warnock RA, Springer TA, von Andrian UH (July 1996). "Platelet-mediated lymphocyte delivery to high endothelial venules". Science. 273 (5272): 252–5. Bibcode:1996Sci...273..252D. doi:10.1126/science.273.5272.252. PMID 8662511. ^ Iannacone M, Sitia G, Isogawa M, Marchese P, Castro MG, Lowenstein PR, Chisari FV, Ruggeri ZM, Guidotti LG (November 2005). "Platelets mediate cytotoxic T lymphocyte-induced liver damage". Nature Medicine. 11 (11): 1167–9. doi:10.1038/nm1317. PMC 2908083. PMID 16258538. ^ Oehlers, Stefan H.; Tobin, David M.; Britton, Warwick J.; Shavit, Jordan A.; Nguyen, Tuong; Johansen, Matt D.; Johnson, Khelsey E.; Hortle, Elinor. "Thrombocyte inhibition restores protective immunity to mycobacterial infection in zebrafish". The Journal of Infectious Diseases. doi:10.1093/infdis/jiz110. ^ Gaertner F, Ahmad Z, Rosenberger G, Fan S, Nicolai L, Busch B, Yavuz G, Luckner M, Ishikawa-Ankerhold H, Hennel R, Benechet A, Lorenz M, Chandraratne S, Schubert I, Helmer S, Striednig B, Stark K, Janko M, Böttcher RT, Verschoor A, Leon C, Gachet C, Gudermann T, Mederos Y, Schnitzler M, Pincus Z, Iannacone M, Haas R, Wanner G, Lauber K, Sixt M, Massberg S (November 2017). "Migrating Platelets Are Mechano-scavengers that Collect and Bundle Bacteria". Cell. 171 (6): 1368–1382.e23. doi:10.1016/j.cell.2017.11.001. PMID 29195076. ^ Boilard E, Nigrovic PA, Larabee K, Watts GF, Coblyn JS, Weinblatt ME, Massarotti EM, Remold-O'Donnell E, Farndale RW, Ware J, Lee DM (January 2010). "Platelets amplify inflammation in arthritis via collagen-dependent microparticle production". Science. 327 (5965): 580–3. Bibcode:2010Sci...327..580B. doi:10.1126/science.1181928. PMC 2927861. PMID 20110505. ^ a b Palankar R, Kohler TP, Krauel K, Wesche J, Hammerschmidt S, Greinacher A (June 2018). "Platelets kill bacteria by bridging innate and adaptive immunity via platelet factor 4 and FcγRIIA". Journal of Thrombosis and Haemostasis. 16 (6): 1187–1197. doi:10.1111/jth.13955. PMID 29350833. ^ McMorran BJ, Wieczorski L, Drysdale KE, Chan JA, Huang HM, Smith C, Mitiku C, Beeson JG, Burgio G, Foote SJ (December 2012). "Platelet factor 4 and Duffy antigen required for platelet killing of Plasmodium falciparum". Science. 338 (6112): 1348–51. Bibcode:2012Sci...338.1348M. doi:10.1126/science.1228892. PMID 23224555. ^ Murakawa M, Okamura T, Tsutsumi K, Tanoguchi S, Kamura T, Shibuya T, Harada M, Niho Y (1992). "Acquired von Willebrand's disease in association with essential thrombocythemia: regression following treatment". Acta Haematologica. 87 (1–2): 83–7. doi:10.1159/000204725. PMID 1585777. ^ van Genderen PJ, Leenknegt H, Michiels JJ, Budde U (September 1996). "Acquired von Willebrand disease in myeloproliferative disorders". Leukemia & Lymphoma. 22 Suppl 1: 79–82. doi:10.3109/10428199609074364. PMID 8951776. ^ "Platelet Function Assay FAQ" (PDF). Department of Pathology. Virginia Commonwealth University. Retrieved 2017-03-27. ^ Geddis AE (February 2013). "Inherited thrombocytopenias: an approach to diagnosis and management". International Journal of Laboratory Hematology. 35 (1): 14–25. doi:10.1111/j.1751-553x.2012.01454.x. PMID 22846067. ^ Cure MC, Cure E, Kirbas A, Cicek AC, Yuce S (July 2013). "The effects of Gilbert's syndrome on the mean platelet volume and other hematological parameters". Blood Coagulation & Fibrinolysis. 24 (5): 484–8. doi:10.1097/MBC.0b013e32835e4230. PMID 23348429. ^ Kornerup KN, Page CP (August 2007). "The role of platelets in the pathophysiology of asthma". Platelets. 18 (5): 319–28. doi:10.1080/09537100701230436. PMID 17654302. ^ Erpenbeck L, Schön MP (April 2010). "Deadly allies: the fatal interplay between platelets and metastasizing cancer cells". Blood. 115 (17): 3427–36. doi:10.1182/blood-2009-10-247296. PMC 2867258. PMID 20194899. ^ Pleass RJ (July 2009). "Platelet power: sticky problems for sticky parasites?". Trends in Parasitology. 25 (7): 296–9. doi:10.1016/j.pt.2009.04.002. PMC 3116138. PMID 19539528. ^ "Summaries for patients. Platelet function after taking Ibuprofen for 1 week". Annals of Internal Medicine. 142 (7): I–54. April 2005. doi:10.7326/0003-4819-142-7-200504050-00004. PMID 15809457. ^ Rao GH, Johnson GG, Reddy KR, White JG (1983). "Ibuprofen protects platelet cyclooxygenase from irreversible inhibition by aspirin". Arteriosclerosis. 3 (4): 383–8. doi:10.1161/01.ATV.3.4.383. PMID 6411052. ^ van Veen JJ, Nokes TJ, Makris M (January 2010). "The risk of spinal haematoma following neuraxial anaesthesia or lumbar puncture in thrombocytopenic individuals". British Journal of Haematology. 148 (1): 15–25. doi:10.1111/j.1365-2141.2009.07899.x. PMID 19775301. ^ Roback J, Grossman B, Harris T, Hillyer C, eds. (2011). Technical Manual (17th ed.). Bethesda MD: AABB. p. 580. ISBN 978-1-56395-315-6. ^ American Association of Blood Banks (2003). "5.1.5.1". Standards for Blood Banks and Transfusion Services (22nd ed.). Bethesda MD: AABB. ^ Högman CF (January 1992). "New trends in the preparation and storage of platelets". Transfusion. 32 (1): 3–6. doi:10.1046/j.1537-2995.1992.32192116428.x. PMID 1731433. ^ Ruane PH, Edrich R, Gampp D, Keil SD, Leonard RL, Goodrich RP (June 2004). "Photochemical inactivation of selected viruses and bacteria in platelet concentrates using riboflavin and light". Transfusion. 44 (6): 877–85. doi:10.1111/j.1537-2995.2004.03355.x. PMID 15157255. ^ Perez-Pujol S, Tonda R, Lozano M, Fuste B, Lopez-Vilchez I, Galan AM, Li J, Goodrich R, Escolar G (June 2005). "Effects of a new pathogen-reduction technology (Mirasol PRT) on functional aspects of platelet concentrates". Transfusion. 45 (6): 911–9. doi:10.1111/j.1537-2995.2005.04350.x. PMID 15934989. ^ Prowse CV (April 2013). "Component pathogen inactivation: a critical review". Vox Sanguinis. 104 (3): 183–99. doi:10.1111/j.1423-0410.2012.01662.x. PMID 23134556. ^ AABB (2009). Standards for Blood Banks and Transfusion Services (26th ed.). Bethesda MD: AABB. ^ Schoenfeld H, Spies C, Jakob C (March 2006). "Volume-reduced platelet concentrates". Current Hematology Reports. 5 (1): 82–8. PMID 16537051. ^ CBBS: Washed and volume-reduced Plateletpheresis units. Cbbsweb.org (2001-10-25). Retrieved on 2011-11-14. ^ Gawaz M, Vogel S (October 2013). "Platelets in tissue repair: control of apoptosis and interactions with regenerative cells". Blood. 122 (15): 2550–4. doi:10.1182/blood-2013-05-468694. PMID 23963043. ^ Schmaier AA, Stalker TJ, Runge JJ, Lee D, Nagaswami C, Mericko P, Chen M, Cliché S, Gariépy C, Brass LF, Hammer DA, Weisel JW, Rosenthal K, Kahn ML (September 2011). "Occlusive thrombi arise in mammals but not birds in response to arterial injury: evolutionary insight into human cardiovascular disease". Blood. 118 (13): 3661–9. doi:10.1182/blood-2011-02-338244. PMC 3186337. PMID 21816834. ^ Belamarich FA, Shepro D, Kien M (November 1968). "ADP is not involved in thrombin-induced aggregation of thrombocytes of a non-mammalian vertebrate". Nature. 220 (5166): 509–10. Bibcode:1968Natur.220..509B. doi:10.1038/220509a0. PMID 5686175. ^ Godlee, Sir Rickman (1917). Lord Lister. London: Macmillan & Co.
^ Robb-Smith AH (July 1967). "Why the platelets were discovered". British Journal of Haematology. 13 (4): 618–37. doi:10.1111/j.1365-2141.1967.tb00769.x. PMID 6029960. ^ Brewer DB (May 2006). "Max Schultze (1865), G. Bizzozero (1882) and the discovery of the platelet". British Journal of Haematology. 133 (3): 251–8. doi:10.1111/j.1365-2141.2006.06036.x. PMID 16643426. ^ Wright JH (1910). "The histogenesis of blood platelets". Journal of Morphology. 21 (2): 263–78. doi:10.1002/jmor.1050210204. hdl:2027/hvd.32044107223588. ^ Furie B, Furie BC (August 2008). "Mechanisms of thrombus formation". The New England Journal of Medicine. 359 (9): 938–49. doi:10.1056/NEJMra0801082. PMID 18753650.